María Velasco is a Spanish-born artist who has been living and working in the US since 1991. Her interdisciplinary work consists of site-specific environments, urban interventions, sculptural objects, and temporary public art commissions. Her work deals with issues of displacement, migration, gender identity, vulnerability, and the structures of authority that govern our lives. She has shown her work nationally and internationally in university and private museums, and contemporary art venues such as The Soap Factory in Minneapolis, MN; the Contemporary Arts Forum in Santa Barbara, CA; the ARC gallery in Chicago, IL; the Spencer Museum of Art in Lawrence, KS; H&R Block Artspace, the Kansas City Artists Coalition, Avenue of the Arts in Kansas City, MO; the Albrecht-Kemper Museum of Art in Saint Joseph, MO; the Paula Cooper gallery and the Elizabeth Foundation for the Arts, both in New York City. Internationally, she has exhibited in Salón Tentaciones (Madrid, Spain), Museo Del Barro (Asunción, Paraguay), Paradise Gardens Biennial VI, (Darmstadt, Germany), Mexico, Argentina and Morocco. Her work appears in prestigious publications including Art In America and Sculpture Magazine, and has been reviewed by The Kansas City Star, Art Focus Oklahoma; The Village Voice, and the Chicago Reader. 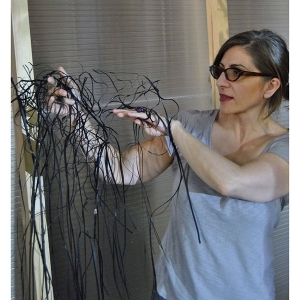 She was Artist-in-Residence at Sculpture Space (2007) and International Artist-in-Residence at Proyecto 'Ace, in Buenos Aires, Argentina (2012). In 2016, she was Artist-in-Residence at Green Olive Arts, in Tetouan, Morocco. In the summer of 2019, she will be artist-in-residence at MOTHRA, an ongoing Artist-Parent Project in Toronto, Canada. She has also been invited to Marble House Project residency in Dorset, VT, and a family-friendly residency at Elsewhere Studios, in Paonia, CO. Her professional contributions include leading independent curatorial projects, discussion panels, and workshops nationally and abroad. She has been a juror for the National Endowment for the Arts (Washington DC) in 2002 and 2005 and has served in the Board of Directors for MidAmerica College Art Association (MACCA), and in various committees at College Art Association (CAA). She has received numerous awards and grants; most notably, a Rocket Grant Award-a program of the Kansas City Charlotte Street Foundation and the University of Kansas Spencer Museum of Art (funded by the Andy Warhol Foundation for the Visual Arts); Lighton International Artist Exchange Program Grant; Kansas Arts Commission Collaborative Grant; Avenue of the Arts Foundation Grant; Kansas Arts Commission Individual Artist Fellowship for Interdisciplinary Art, and Elizabeth Firestone Graham Foundation Emerging Artists Grant. Velasco was the first student in Visual Art to obtain a scholarship through the Madrid-California Education Abroad program at the Universidad Complutense of Madrid, Spain. María Velasco received her Bachelor Degree in Painting from the Universidad Complutense of Madrid in 1989, and her Master of Fine Arts in New Genre from the University of California at Santa Barbara in 1993. She is an Associate Professor of Visual Art in the Expanded Media Department at the University of Kansas, and teaches courses in Installation Art, Participatory Art, Expanded Media, Professionalism in the Arts, Contemporary Theory and Criticism, Drawing, and Life Drawing. She currently lives in Lawrence, KS with her nine year old son, Alex, who loves to draw and make art. 2005 Step-By-Step Ascension To Paradise, Outdoor Installation (with Janet Davidson-Hues), curated by Ute Ritschel, Paradise Gardens Biennial VI, Darmstadt, Germany. 1997 Material/Immaterial, No Name Exhibitions @ The Soap Factory Gallery, Minneapolis, MN. 1993 Speaking KnotsHablando Nudos, (...And A Dream Journal), MFA Thesis Show, University Art Museum, University of California, Santa Barbara, CA. 2001-pres Associate Professor of Art, Visual Art Department, School of The Arts, University of Kansas, Lawrence, KS. Teach courses in Installation Art, Participatory Art, Expanded Media, Professionalism in the Arts, Contemporary Theory and Criticism, Drawing, and Life Drawing. 1995-2001 Assistant Professor of Art, Visual Art Department, School of The Arts, University of Kansas, Lawrence, KS. Teach courses in Installation Art, Contemporary Theory and Criticism, Drawing, and Life Drawing.